For restless people looking to pump up their adrenaline, there’s always roller coasters to do the trick. And each time you get into a roller coaster, there’s always an attendant making sure that your safety belt or safety bar is properly placed. However, when the roller coaster loops upside down, it’s not these devices that keep you in place, but physics. Basically, acceleration is a change in direction or speed. But when something moves in a circle, it’s constantly changing direction, therefore it’s constantly accelerating, even if its speed remains the same. The force that causes the acceleration toward the center of a circle is called centripetal force. If you attach an object to a string, and then swing it in circles, the string remains tight, and its pull forces the object to move in a circle. You can feel the constant force at the other end of the string, but if you let it go the object flies away. When you ride a roller coaster through a loop, a similar process takes place. You ‘re constantly changing direction, thus accelerating, as the track is constantly pushing the car into a new direction. The car pushes against the track, and the track pushes against the car, and as a result, the seat of the car pushes you in the same direction. You get used to an upward push against the downward pull of gravity, so when you get to the bottom of the loop, you don ‘t notice the upward push. As you go through the loop, your own inertia tends to keep you moving in a straight line, away from the center of the circle. At the same time, centripetal force is always pushing you towards the center of the circle. When you go over the top you feel you should continue up into the air, but the car is pushing against you to prevent it. You would stay in the car even without the safety bar. However, don ‘t try it. Then, when you go through the bottom of a dip or over the top of a hill on the roller coaster, centripetal force will again affect you. 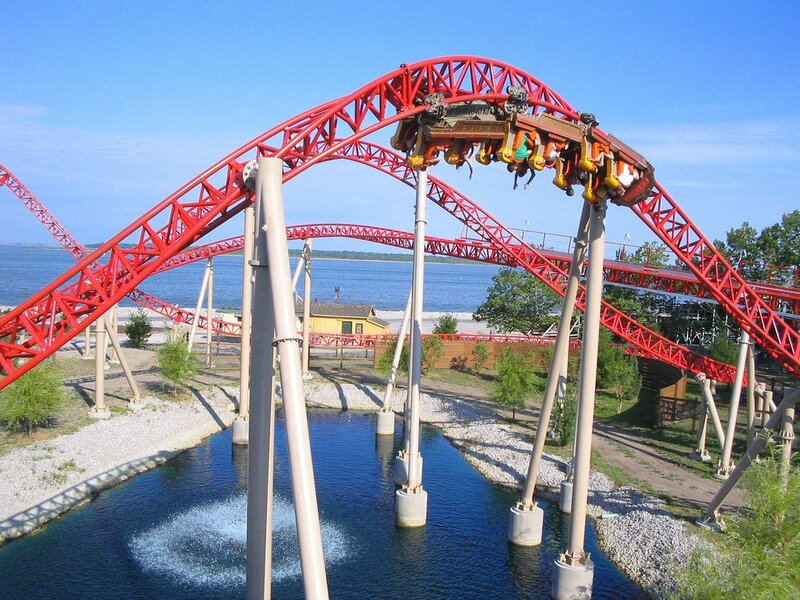 As the roller coaster passes through a dip, centripetal force will constantly push it upward, towards the center of the curve, while the rider is pushed downward by gravity. You feel heavier in the deep due to the combination of the upward force and gravity. As you ride over the top of a hill, centripetal force pulls the car beneath you toward the center of the curvature. But this time, the car does not push you in because you are above it and the force is downward. Your inertia carries you upward until the safety bar exerts a downward force. At this point, the safety bar becomes extremely important. If the force is large enough, you will feel weightless at the point where the downward force of gravity is exactly equal to your inertia upward.